Our packaging solutions offer many simple ways to protect and present your CDs and DVDs for different events, customers and products. 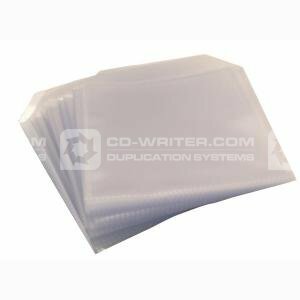 Our Plastic CD/DVD Wallets are a fantastic and convenient way of maintaining a look of professionalism and style whilst protecting your copied/printed CD and DVD discs. The vinyl plastic wallets are a cost effective solution for packing and storing your discs and are ideal for mailouts, promo discs and office requirements providing a high standard of presentation and protection for your copied media. Our plastic wallets are designed not to split ensuring your disc will be retained and protected for years to come. Plastic . CD . Wallets . Pack . of . 100 . Unbranded .